Winner of three Tony Awards and the 2010 Pulitzer Prize for Drama, Next to Normal explores a suburban household affected by mental illness. 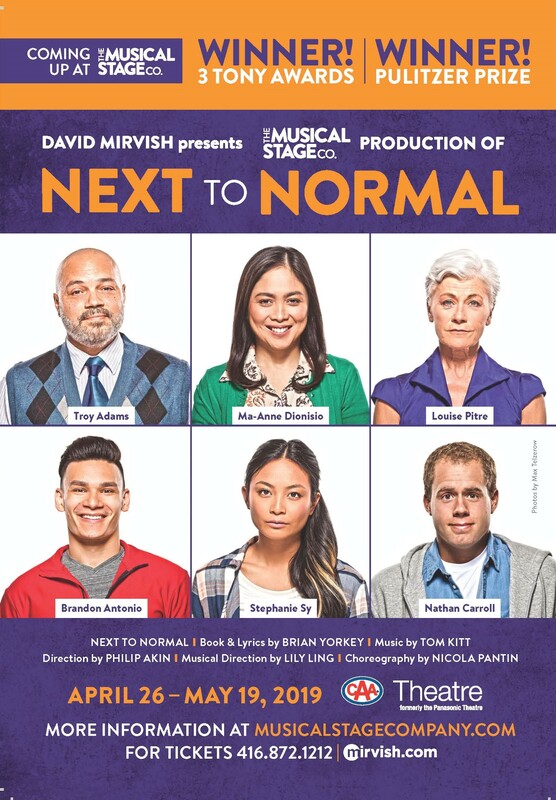 With a gripping story and a surging contemporary rock score, Next to Normal is a raw depiction of a family in crisis trying to overcome the past. Starring internationally acclaimed Ma-Anne Dionisio (Miss Saigon, Les Misérables) and featuring a powerhouse ensemble of Canada’s top performers, Dora Award-winner Philip Akin directs an exhilarating new production of this favourite contemporary musical. "Rock is alive and rolling like thunder in Next To Normal. An emotional powerhouse." "An impressive achievement, a heartfelt entertainment"
Runs April 26, 2019 – May 19, 2019 at the CAA Theatre (formerly the Panasonic) 651 Yonge Street, Toronto.